Saying goodbye to Elena Gilbert is one thing. Moving on from the monumental shadow of her presence is something else altogether. The Vampire Diaries’ season seven premiere tries its hardest to do just that, and the resulting episode is an uneven mix of compelling realigned relationships, clunky exposition, and an interesting idea for a season that’s somewhat marred by the awkwardness of its execution. It’s a mixed bag, but it’s a fun enough mixed bag that it’s easy to be intrigued about what’s coming next—and genuinely exciting to see the show trying something different so far into its run. The issue with the premiere isn’t that Elena’s absence is a problem—her presence still looms large over all of the characters in an organic way, especially in the case of Damon and Bonnie—it’s that some of the ways the show is dealing with her absence are a bit goofy. The goofiest bit might be the literal passing of the torch from Elena to Caroline via Caroline writing in a diary to keep Elena abreast of everything that is happening while she’s in her magic coma. This is likely largely a personal preference (as the intermittently used diary framework has never been my favorite thing) but Caroline’s diary reading here feels too much like the show being stuck in its past, while everything around the diary framework desperately works overtime to move on. Still, it’s hard to fault the show for cheekily nodding to its roots, even if the result feels a bit more adolescent than I think was the intent. With Elena’s absence dealt with on a character level, The Vampire Diaries must also work to deal with it on a more structural level, as there is now a giant gaping hole in the center of the show where Elena’s stories used to be. This is where things get the most interesting, as the show commits to introducing narrative and structural tricks to its repertoire. The episode opens with a mysterious scene set three years in the future, as Stefan revives a desiccated Damon who is snoozing in a coffin. 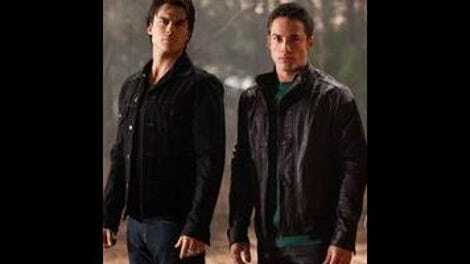 The episode then jumps back and forth from this future scene to the present, finally ending on an exciting sequence that shows Stefan and Damon clearly on the run from someone (although Damon is angry at Stefan for waking him up before Elena is back), and that someone is currently hot on their tails. Whoever this someone is remains the big mystery, and the audience’s interest in finding out what’s really going on in these flash forwards the main narrative conceit of the upcoming season. It’s a fairly staunch departure from what the show normally does, narratively, and it’s a compelling enough change to make me more than a bit curious to see how it develops as the season progresses. What’s a bit less successful is the way things are progressing narratively in the present. Lily and her band of murderous, evil Heretics are the main antagonists here, and their disregard for anything regarding decorum is neatly set up with a gruesome scene of them attacking Matt’s deputy graduation ceremony as retaliation for Matt and Caroline’s attempt to kill them. (In their defense, Matt and Caroline did start it.) What happens next—with the gang conspiring to evacuate the entire town of Mystic Falls and ceding it to the Heretics completely—is a good idea that’s totally botched in execution. It’s great to see the show finally recognizing that Mystic Falls is a terrible place to live and getting civilians out of danger. Not great is the way they do it, via awkward voiceover and even more awkward pacing. Basically, the destination is pretty good but the journey to get there is a nightmare. At least now that the setup is complete, the show can get back to simply telling stories about the aftermath, which is where it usually shines. As for the other characters, Matt is still in a strange limbo state between hating vampires and having them as his friends (they’ve never quite figured out his position on this after all these years), but at least he has a purpose at the Sheriff’s office now, by attempting to keep the town safe in a more official capacity. It’s Caroline and Stefan that still feel like they aren’t yet quite solid enough as a duo to be the new central pairing of the show. Caroline and Stefan as friends always felt natural and like a great counterpoint to the show’s other romantic relationships. Caroline and Stefan as the central love story is on less solid footing, at least in the halting way it starts here. Certainly, like everything else in this transitional period, it deserves a chance to develop and grow. Whether it gets stronger—or fizzles out and dies—is yet to be seen. What does everyone think about the Heretics? I’m reserving judgment until at least the next episode, but they don’t seem like such an immediate threat that the entire town suddenly has to be evacuated. So the flash forwards we saw in the season six finale were barely flash forwards at all, not connected to the real “three years later” flash forwards of the show’s ongoing narrative framework. This is a fun choice. Alaric drinks tea instead of bourbon in order to fool Damon and Bonnie? How very musical theater of you, Ric. Duncan Kane would approve. 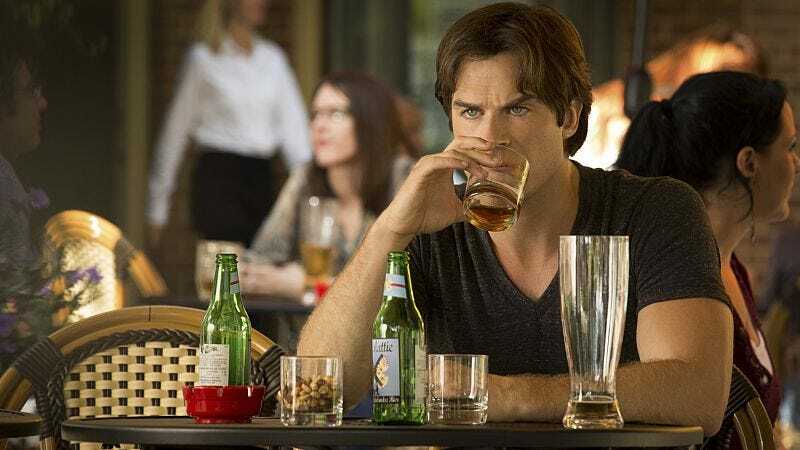 I could watch an entire show about Damon and Ric drinking their way through Europe with Bonnie as their exasperated companion. Spin off! Speaking of Ric, what the heck is he up to? Beating up fake psychics, possessing a stone Lily needs, keeping Jo cold in the morgue so he can bring her back to life? Good thing self-destructive Ric is the best Ric. Enzo is a bad guy now and working with Lily. Okay. Whatever.